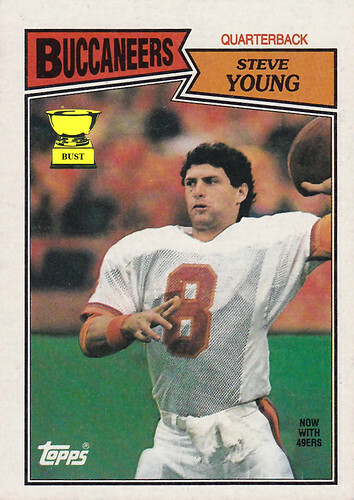 Man, Steve Young looks young in this photo. Just how young was he? He's still sporting the Garbage Pail Kids haircut his mom let him choose. He's playing for the Salt Lake City High School Buccaneers, a team that won 186 more games than the Tampa Bay Buccaneers in the 1980s. He's still learning how to control the mutant fingers on his right hand. He gets to wear his age for every game. Next season, he's big No. 9. Hooray, Stevie. That's not a towel hanging from his waist; it's his blankie.